goodwill, hard work and good times. Grown up Bit finds himself raising his daughter alone and looking for guidance from his elders. Geoff's writing style gracefully evokes the sensitivity and compassion that is Bit's character. Enchanting. Check out my other picks! In the fields of western New York State in the 1970s, a few dozen idealists set out to live off the land, founding a commune centered on the grounds of a decaying mansion called Arcadia House. Arcadia follows this romantic utopian dream from its hopeful start through its heyday. Arcadia's inhabitants include Handy, the charismatic leader; his wife, Astrid, a midwife; Abe, a master carpenter; Hannah, a baker and historian; and Abe and Hannah's only child, Bit. While Arcadia rises and falls, Bit, too, ages and changes. He falls in love with Helle, Handy's lovely, troubled daughter. And eventually he must face the world beyond Arcadia. 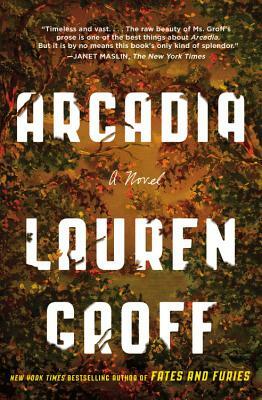 In Arcadia, Groff displays her literary gifts to stunning effect. Lauren Groff is the author of The Monsters of Templeton, shortlisted for the Orange Prize for New Writers; Delicate Edible Birds, a collection of short stories; and Fates and Furies, a National Book Award finalist. Her writing has appeared in The New Yorker, The Atlantic Monthly, Harper's, Tin House, One Story, McSweeney's, and Ploughshares, and in the anthologies 100 Years of the Best American Short Stories, The Pushcart Prize: Best of the Small Presses, PEN/O. Henry Prize Stories, and three editions of The Best American Short Stories. She lives in Gainesville, Florida, with her husband and two sons.